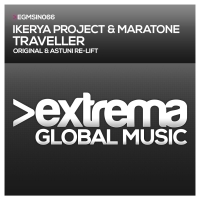 Another slice of trance quality from Extrema this time from Ikerya Project and Maratone with Traveller. A solid trance groover with a big breakdown and packed with influences from across the genre and beyond - Traveller ticks a lot of boxes when it comes to class and pedigree. Extrema man Astuni is on remix duty and as you would expect, he does not disappoint. 'Traveller' is available now from Beatport and iTunes.